Women in labor love water! 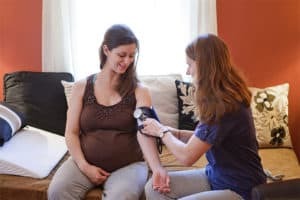 Home/Medical Facts/Women in labor love water! There is no question – when a laboring woman steps into a warm pool of water, the relief she most often feels is immediate. While being submerged in water does not make labor pain free, most commonly women say the water comforts them, takes the edge off of the pain, allows them to move around more freely and to cope more easily with the natural intensity of labor. A majority of the women in labor at our Monadnock Birth Center, make use of our beautiful water pools in each of our birth suites. Authorities agree that laboring in water is good for women. Pain in labor can be increased by fear, creating a pain-fear-pain cycle. Women who labor in water often report having less fear and more sense of control. Studies bear out this perception and show that women choosing water for labor have less need for pain medication, including epidurals. Floating in warm water increases your flow of endorphins – nature’s pain relievers – hormones that can block or lessen your experience of pain. Because water helps you relax, it reduces the stress hormones that can slow down labor. In short, for some women, warm water can help you have a shorter labor! Many women who labor in water don’t want to get out of the birth pool to push their babies out – they want to give birth in the water. Although some women naturally want to get out of the water when they begin to push, many women who are asked to get out of the tub often report feeling disrupted and distressed. While everyone agrees that laboring in water is of benefit to women, there is controversy about giving birth in water. Researchers are increasingly looking at the effects on babies of being born in the water and finding reassuring results. While many doctors say there is not enough evidence on safety and the practice can be controversial in the United States, women in Europe are supported by their care providers in their desire for water birth. Now, the largest study ever undertaken and the first to study mothers in the United States, published in the January 2016 Journal of Midwifery and Women’s Health, showed no evidence of harm to babies born under water. The results were clear: babies born under water fared as well as those babies whose mothers did not choose a water birth. It provides solid evidence that water birth can be a safe option for healthy women and their babies.